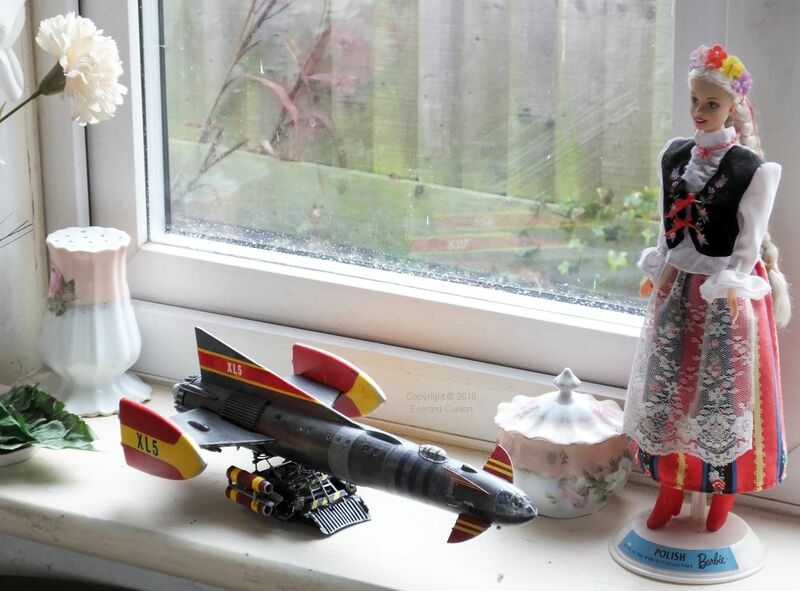 Fireball XL5 was a 1962 puppet and scale model based science-fantasy television series by Sylvia and Gerry Anderson, creators of the subsequent and better-known Thunderbirds series. 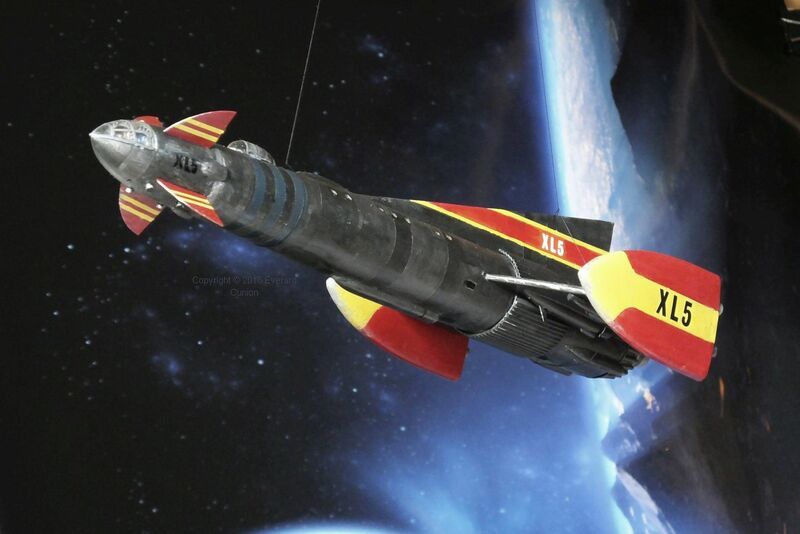 Fireball XL5 (along with its XL sister ships, numbering more than 20) was a spacecraft, the fuselage of which resembled that of the B-29 World War 2 bomber, but it had the engine, wing, and fin layout of the X-15 research rocket-plane, and the armament of the F-102/F-106 interceptor jets. Forget the thin plots, weak humour, the unrealistic puppets lurching about, and the silly song at the end. The genius of Fireball XL5 was the spacecraft itself together with its launch system and the series’ special effects (special for the time). If you watch the Fireball XL5 crew boarding and launch video extract from the colorized edition (see links at the bottom of the page) you have seen everything worth seeing, in my opinion. 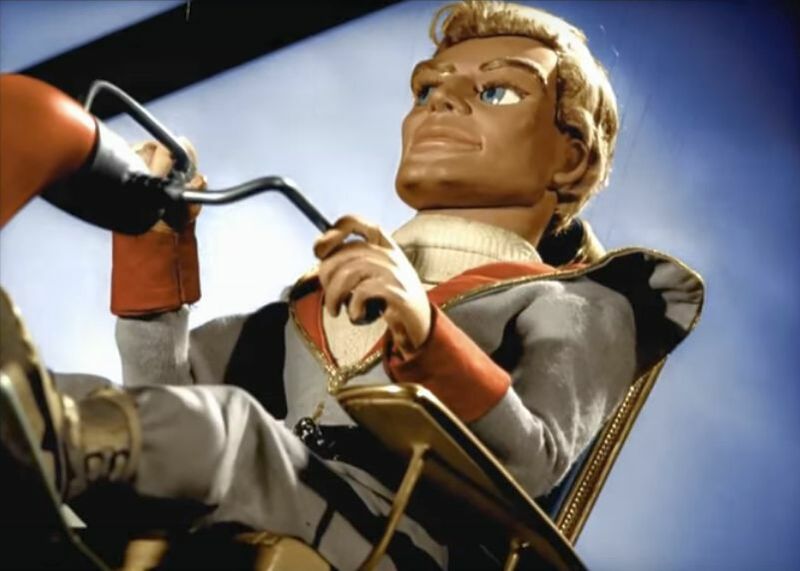 Its creators, Sylvia and Gerry Anderson, clearly recognised its appeal to six-year-old boys like me and put a great amount of effort into depicting this possible future technology – this young man’s ticket to success in life. Its dark metallic appearance with contrasting bright markings gave it a unique quality. Even the crew’s hover bikes (jetmobiles) were awesome. Incidentally, I classify it as science-fantasy (a contradiction) rather than science-fiction because, while reaching orbit in such a craft could be done (although it might need some extra fuel/propellant than there is room for inside) arriving at a planet orbiting another star a few days, weeks, or even months later is not possible. This model, which is about 1/200th scale, is 14 inches (36 cm) long. The real thing, if there was one, would have been about 230 ft long. That’s about the size of a Boeing 747 (stretched versions). Even in 1962, the dawn of the space age, engineers felt that the crude ‘capsule’ on top of a rocket would eventually be replaced by the ‘spaceplane.’ The North American X-15 (you could misspell that Xl5) was exactly that. Although it was air-dropped from a B-52 rather than launched from the ground, it was, like the later space shuttle, a space-capable aircraft. Indeed, the slab trailing edges of the XL5’s fin and wings resemble those of the X-15. I do not know of any spacecraft that was launched from a rail in that way, but I see no reason why it could not be done. The ‘ski jump’ ramp on some Harrier carrier flight decks is the closest operational configuration I can think of. And, like the AV-8 Harrier, Fireball XL5 can land and take off vertically after it has reduced its all-up weight sufficiently by having used up enough fuel/propellant. 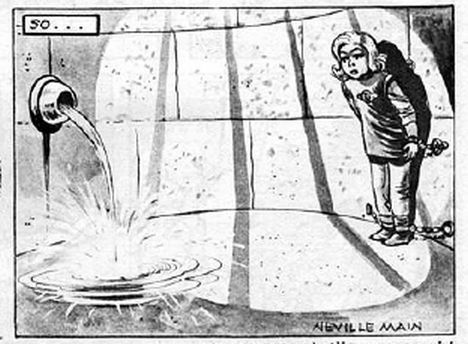 The image of Venus in a dungeon is from the series Fireball XL5 in TV Comic, week ending December 15th, 1962. I lay awake nights wanting to save her as the water rose to the level of her breasts. When I grew up, I would replace Steve Zodiac at the controls of XL5 and, assuming one of us saved her from the dungeon, I would then possess Venus and my life would be complete. 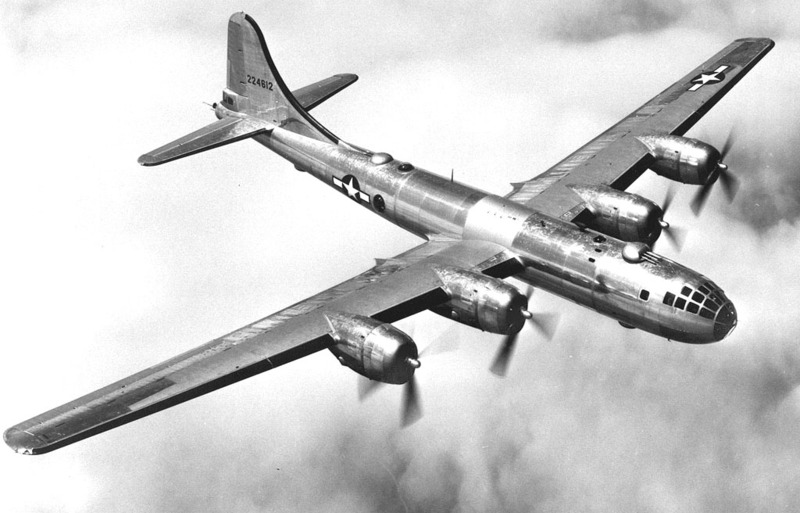 The accompanying image is of a Boeing B-29, whose bombs ended World War 2 less than 20 years before Fireball XL5. It illustrates the likely inspiration behind the layout of the XL5 fuselage. However, the XL5 (if it was real) was more than twice the size of a B-29. The B-29 fuselage was pressurised to provide a shirtsleeve environment for its crew at high altitude, exactly as with Fireball XL5. That crew defended their airplane with remotely controlled gun turrets, while the XL5 used missiles on extendable pylons housed in bays much like those of the contemporary delta wing Convair F-102 and F-106 interceptor jets. 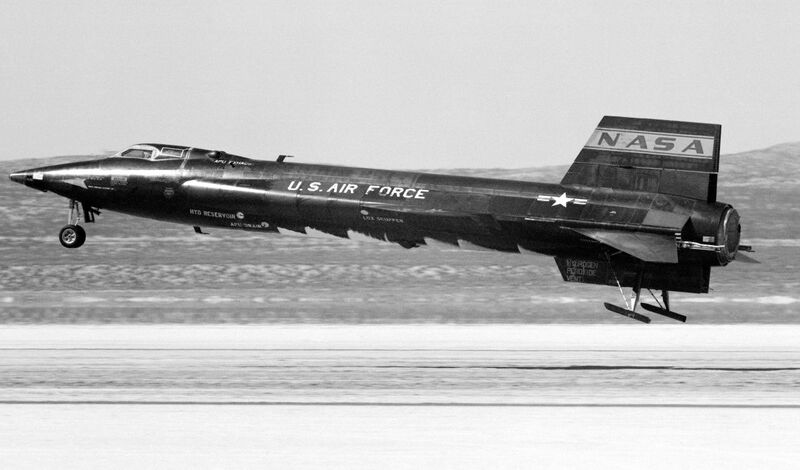 In the accompanying photo of an X-15, the NASA logo on the fin resembles the XL5 paint scheme. I assume that the zigzag pattern under the belly is frost that formed outside the liquid oxygen tanks. While Boeing B-29s were left (mostly) in a bare metal finish, North American X-15s were (mostly) flat black. 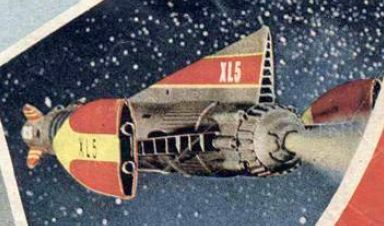 The XL5 seems to be a compromise in that respect, as if it had once been mainly black, but had weathered to a gunmetal sheen from years of atmosphere- and space-dust abrasion. On the subject of scale accuracy, even the original figures were not accurate in that their heads were disproportionately large. 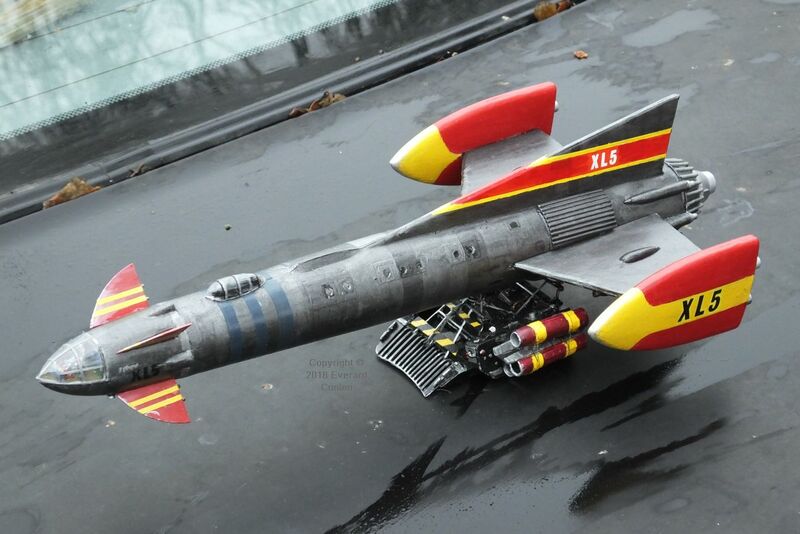 This hard-to-find kit was officially licensed by Gerry Anderson, creator of XL5 and Thunderbirds. Lettering embossed on the plastic indicates that it was created in September of 1987 by a team led by John Harman of J&M Engineering. Made mostly of vacuum-form plastic, it also has a few small conventionally moulded polystyrene parts. The stick-like landing gear legs are metal. The latter, which I did not use, include those of the main spacecraft as well as the skids used by the detachable nose cone, which could operate as an independent spacecraft. In my view, it is a kit for an experienced modeller. It is not suitable for a beginner or anyone unprepared to proceed with caution. Its delicate canopy needs careful cutting and I found that some parts need to be softened with boiling water to curve them. Having said that, it is easier to build than some supposedly mainstream kits. The fictional Fireball XL5, like the contemporary North American X-15 (and the later space shuttle) was a true ‘spaceplane’ in that it used blocky wings for aerodynamic lift when in thick enough atmosphere. 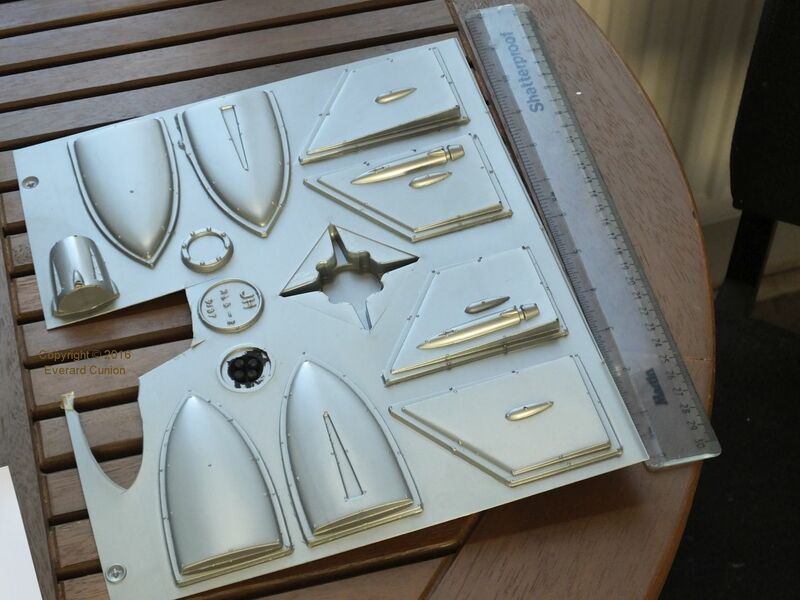 The accompanying photo of the wings, wingtip booster engines, and other parts still part of the moulded plastic sheet illustrates how vacuum moulded kits differ from conventional kits. I had never before tried a vacuum formed kit, but I found it fairly easy to cut the parts out with scissors and then file the edges, after which they fitted perfectly. That is somewhat contrary to the instructions, but it beats scoring with a sharp knife and sanding with glasspaper, in my view. Just don’t cut too close to the part. Leave a millimetre or two to file off, particularly when cutting out small parts, otherwise you risk a sort of diagonal split in the edge of the part. 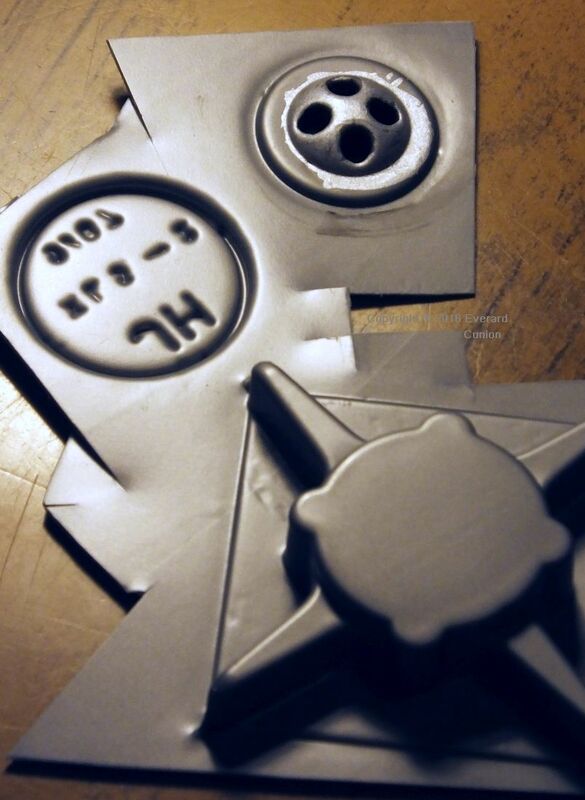 (You repair it with glue…) You need to either cut or file off the little dots round the edges of the larger parts. All of this has to be done with care because some of the plastic is mighty thin. The plastic of my kit is silver-grey, but I have seen photos of other examples in white plastic. Antennae visible in the CAD drawings (link included farther on) on the forward end of the ECM pods under the wings are not supplied, although recesses to attach them are. I obtained antennae from my parts box. (You could make them easily enough from cardboard or cut them from the vacuum plastic sheet.) Also missing are under-wing tubular forward-firing emergency retro rockets, which feature at least in episode 39 The Fire Fighters. I made retro rockets from parts left over from another kit glued to lengths of runner (sprue). I painted the undersides of the wings visible in the accompanying photo to experiment with new ‘metallic’ Humbrol paints. My scratch-built forward-firing emergency retro rockets are attached, but I had yet to glue on the little flat antennae to the built-in ECM pods (if that is what they are). The fuselage and integral fin consists of two halves and some bulkheads. 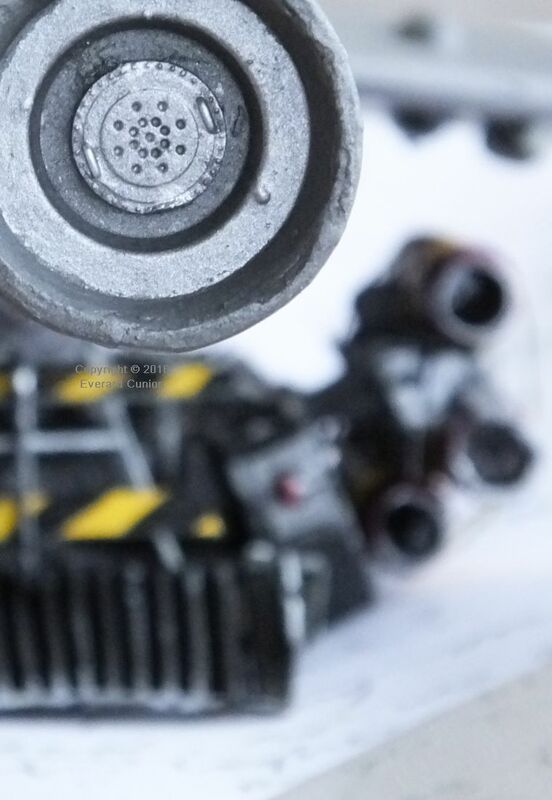 You can drill out the portholes and add glazing or, alternatively, just paint gloss black inside the porthole outlines when the model is built. I doubt that anyone will notice the difference. Nevertheless, I drilled them out to 1/8th inch (3 mm) in stages, as per the instructions. Note: The positions of the portholes are in the kit are inaccurate, at least for the television version. I noticed that too late for my model. The porthole transparencies provided are rather thick, they have a domed shape, they do not seem to fit well, and I found a better way. I stuck a strip of thin Sellotape (clear sticky-back tape) along the inside and a matching strip along the outside. No sticky surface is then exposed, inside or out. I had difficulty cutting away the front bulkhead – half bulkhead because the fuselage is in two halves – while leaving the ‘lip’ in place. The nose section attaches to that. The plastic of the fuselage halves is thin and the front bulkhead is curved in two dimensions, which makes it hard to cut accurately with a modelling knife without inadvertently splitting the main part, which then has to be repaired… What I did not realize was that I retained too much ‘lip’. It is only the outer-most inward curving ring that needs to be retained. I could have used a fine saw and finished the job more easily. The accompanying photo of the starboard fuselage half with bulkheads and fin insert glued in place shows that the aft bulkhead is part of the fuselage half moulding. There is a similar one at the front, but you have to cut that one off to be able to fit the separate recessed bulkhead that mates with the nose cone. You need to cut chunks from the edges of bulkheads B and C to accommodate the wing root recesses. All this is described in the well written instructions. Don’t be put off by their different appearance from conventional kit instructions. If you plan to make the nose cone detachable (as with the ‘real’ XL5) you need to attach a small magnet to the inside of the front bulkhead before you glue the fuselage halves together. The fin and wing trailing edge inserts are among the small number of conventionally moulded parts. You glue them into the back of the fin and wings. You can see the fin insert in the photo. I painted the inside of the fuselage matt black because the astrodome lets you peer in. (You could use the CAD drawings available online as a guide to making the astrodome deck complete with Matt Matic at his navigation table.) In addition, the plastic of some parts is so thin it lets light through in places. I felt that it might even let some light through when the model is painted on the outside, so matt black on the inside is worthwhile insurance. The instructions recommend it too. I did the same with the wings and wingtip booster engines. The corrugated panels around the fuselage in line with the wings are separate parts (three of them) that you cut out, trim, and stick on. However, they are moulded flat, so before you stick them on, you need to ensure that they can curve. The ridges have an inward cant at their ends, which provides rigidity – which (just for once) you do not want! I cut those edges ends off so I could curve those parts to conform to the cylindrical fuselage. To curve each one, I put the plug in the sink and poured boiling water on the part, pulled it out of the sink out with a stick, and then used my fingers to curve the softened polystyrene as best I could. The largest of these three parts took on an additional curvature in the wrong plane all by itself, which you might be able to discern in the accompanying photo. However, when glued to the fuselage and wrapped in tape while the glue dried, it conformed to the fuselage cylinder. The instructions say to add a flat plate under the belly. That is not correct. The ‘real’ XL5 had a ventral pod-like object there, similar to those under the wings. The CAD drawings available online (see farther on for links) seem to me to provide correct imagery of those kinds of detail. You could make one out of balsa wood or a spare missile or torpedo. I used a dorsal fairing left over from my 1/72nd scale Lockheed U-2, which I cut down in length to suit. It is visible in the photo. Originally I intended to install magnets so the nose cone could be detached. However, I had that idea after I assembled the fuselage. I removed the front bulkhead to fit a magnet, but I did too much damage in the process, which I repaired with filler as best I could. Therefore, the nose cone of my XL5 is glued to the fuselage. Needless to say, it is better to throw away hours of effort than to throw away the whole model before it is finished. Judging correctly when to back off and thereby reduce risk is, in my opinion, the mark of the experienced modeller (and of the experienced computer programmer — and likely experienced anything). The accompanying photo of the forward (recessed) bulkhead with the hatch I added is just for the record. I glued the nose cone on so it is now hidden. The hatch, which is 10 millimetres across, I am fairly sure is a wheel hub from a 1/48th scale fighter aircraft, as is the corresponding hatch in the rear of the nose cone (also hidden of course). The flight deck details are sparse (not bad considering their size) although the internal cabin bulkhead is more detailed. Nevertheless, it bears only an impressionist relationship to the original. If you plan to make the nose cone detachable (as with the ‘real’ XL5) you need to attach a small magnet to the inside of the bulkhead before you glue the top and bottom halves together. Make sure it is the correct way round to attract the magnet in the fuselage! 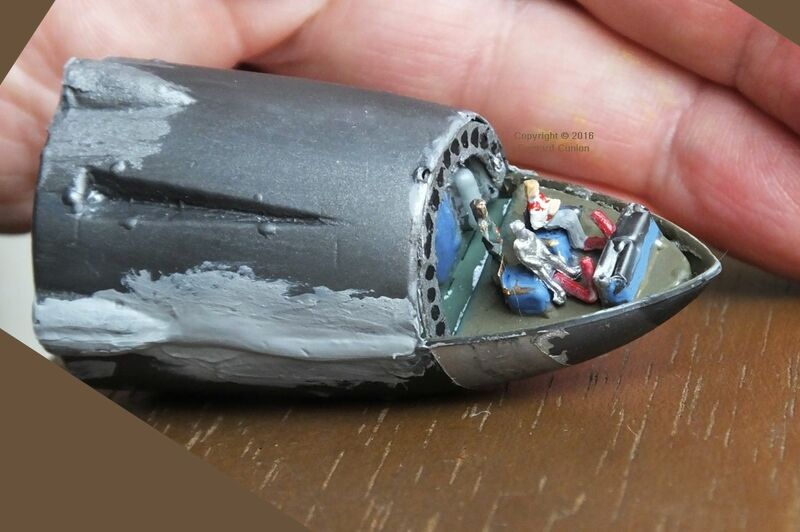 Unfortunately, no crew is provided with the Comet Miniatures kit. For the three crew figures – Venus (standing), Robert the robot, and Steve Zodiac – I used 1/150th scale figures offered via eBay for N-gauge railway modelling. 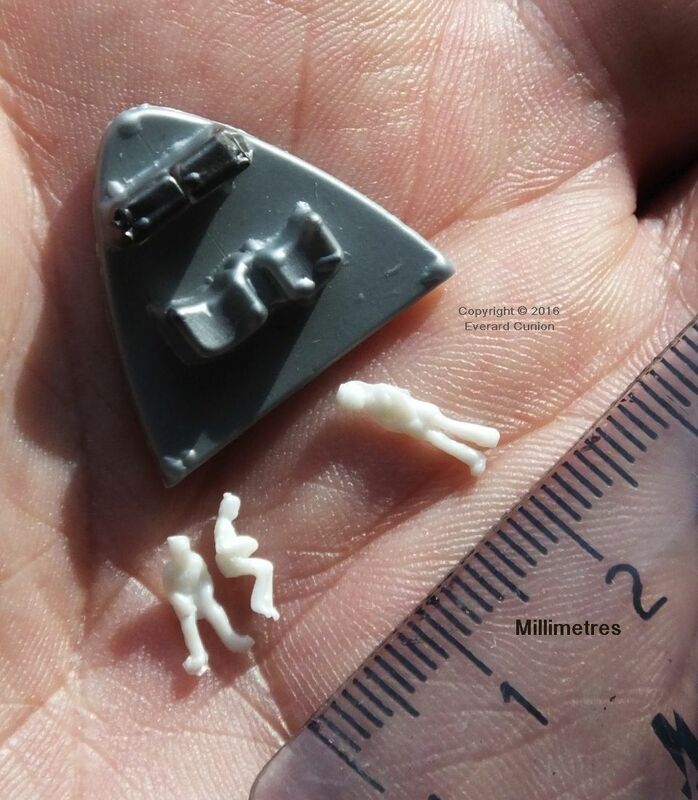 Although oversized for this 1/200th scale model, they are nevertheless tiny! When I took the flight deck photo, I had yet to sand down the filler in the join of the upper and lower half (and add more filler to the air vent blister). Now, before you go on at me about the crudeness of my flight deck, bear in mind its size. The whole nose cone is two-and-a-half inches (six centimetres) long. I made seat backs from paper and the arched frame at the back is cardboard. I made a similar frame to go in the inside of the canopy; just the mid-way one. The red control columns are scraps of plastic (stretched sprue I think). I later trimmed them so they fitted in place better. Robert is half out of his seat somehow, a fact that I noticed only after looking at the photos. 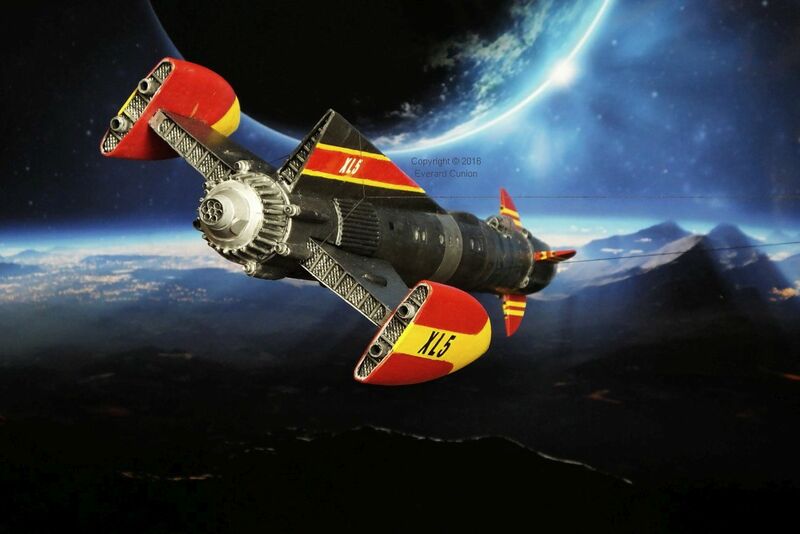 The nose cone, referred to as Fireball Junior in early editions of the television series, could be detached from the main body of the ship and operated as an independent craft. 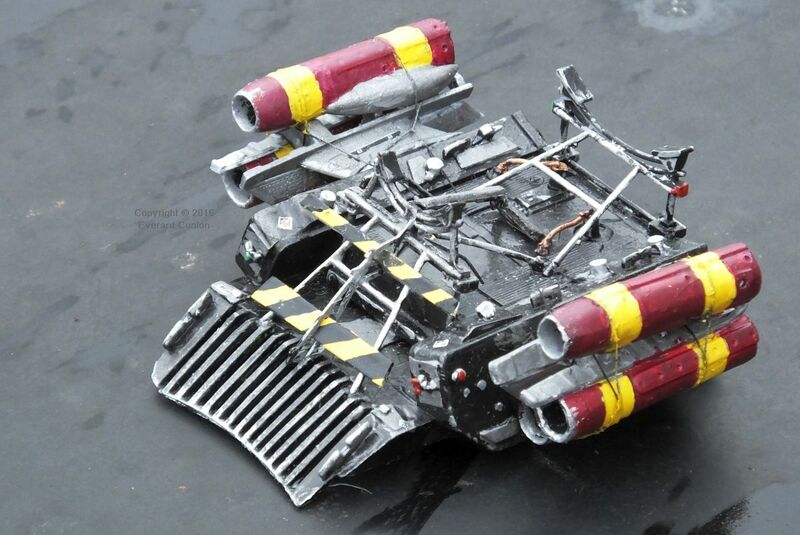 However, the dome-shaped engine exhaust housing supplied with the kit is a mistake. The ‘real thing’ had a flat recess there, not a dome. Fortunately, the kit comes with such a recessed bulkhead. A ring of holes around the outside of the aft face of the nose cone, also supplied with the kit, houses the nose cone rocket engines. (They must have been mighty small.) Merely omit the dome, and it is correct. Indeed, the aft face of the bulkhead had to have incorporated a connecting hatch; otherwise the crew would be unable to get about the ship. All you need do is pencil on a hatch outline or, as I did, glue on a hatch (originally a wheel hub) from the spare parts box. 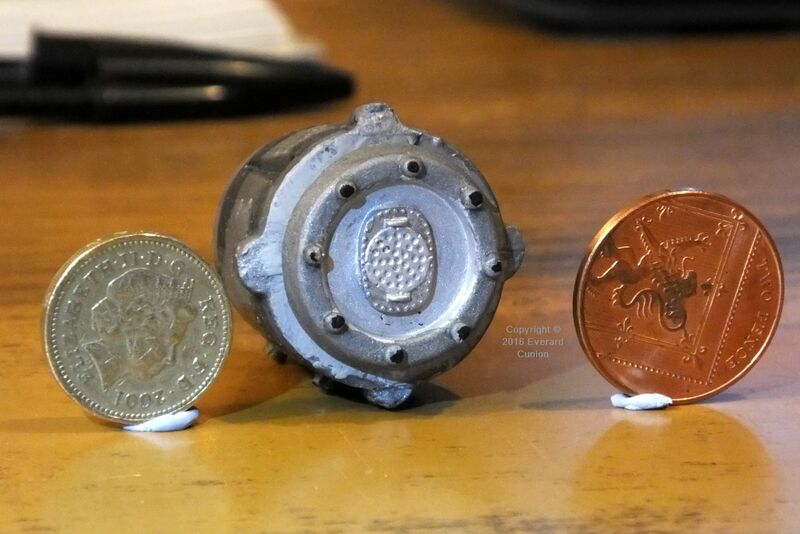 The photo of the nose cone aft face with its hatch demonstrates that the circular external bulkhead is the size of a UK two pence piece. All that is for info only. For the photo, I secured the engine ring with its disc and hatch to the nose cone temporarily. Because of problems I had with the fuselage front bulkhead (previously described) to which the nose cone attaches, I then removed the engine ring and hatch to my spare parts box and glued the nose cone to the fuselage. The canopy is a delicate piece. After cutting it from its sheet, you have to somehow remove its back face, a semi-disc. I used small scissors and followed up with a fine modelling knife. I consider myself fortunate to have only a few splits in the rear of the canopy. Hopefully, they are not too noticeable. The canopy is, to my mind, the greatest weakness of this kit. A spare canopy or two would have been most welcome. You need a round or half-round file to make the base of the transparent plastic astrodome conform to the cylindrical fuselage. It has horizontal stringers embossed, but I see no evidence for them in the ‘real’ Fireball XL5. I coated both canopy and astrodome in Humbrol enamel gloss varnish, inside and out, which improved their clarity greatly. I found shading the nose cone a bit confusing because either the different original models were shaded differently or, alternatively, which bands appear darker or lighter depends on the angle of the light. Maybe both. As previously mentioned, the positions of the portholes are in the kit are inaccurate for the television version, which I noticed too late for my model. If your model represents that version and you use the model’s pre-set porthole positions, be careful when you when you mark out the fuselage panels for shading. Line up the panel edges with reference to more reliably positioned features such as the fin and the astrodome. The decal sheet* in the kit I obtained looked to be in as-new condition. The decal sheet of the only other example of this kit I have seen on eBay was visibly aged. * Transfers as we used to call them here in Britain. Nevertheless, doubtless at least partly because of their quarter century of storage, the decals were fragile and they all broke apart to a greater or lesser extent. 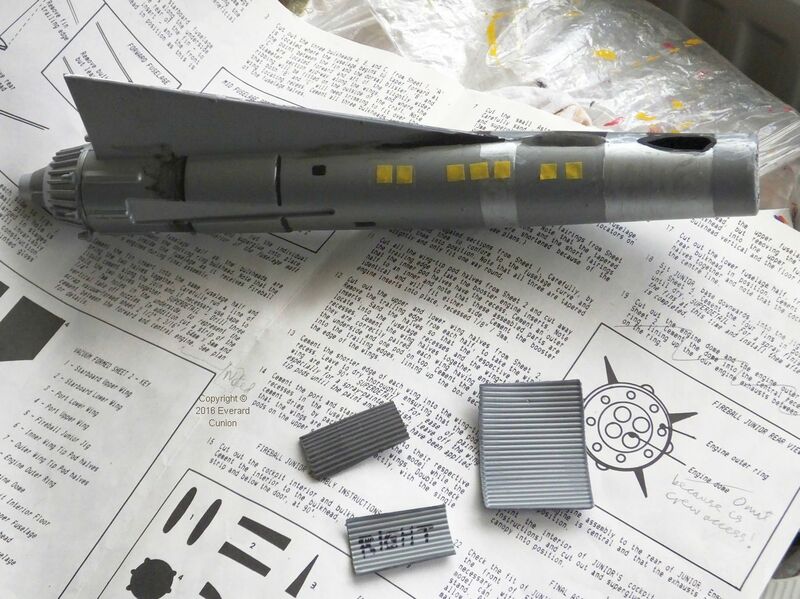 The blue-grey stripes round the fuselage level with the astrodome also broke apart, but there were enough fragments to serve as a basis for completing those markings with paint. Mine are more widely space than the original, the spaces being the width of my reel of masking tape. Isn’t that unrealistic? Check how variable that spacing is among the several original XL5s! I liken that situation to World War 2 invasion stripes applied to allied aircraft overnight before D-Day, the variability of which partly arose from repainting on the days and weeks following. The fin stripes also broke up, but fortunately into large chunks. Even more fortunately, both sides had the white XL5 intact. I pre-painted the fin with a stripe of gloss white as an undercoat for the light coloured decals. The trapezoid runners visible in the photo are from my spare parts box. I had half an idea of using them to create a segment of launch rail. The full idea never came, so I put them back in the parts box. The decals provided for the sides of the nose cone are incorrect if you want to model the version in the television series. (More about another version farther on.) 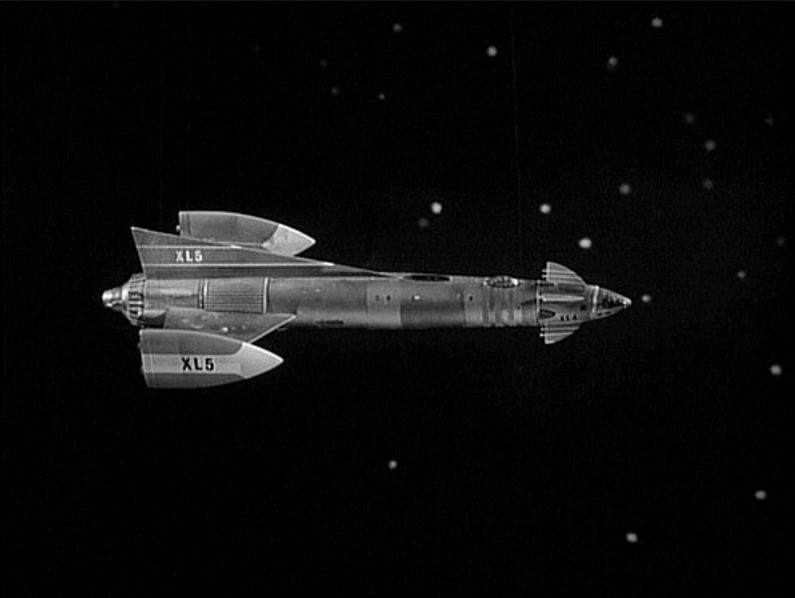 The version in the television series had FIREBALL in stylized white lettering above and to the left of the larger characters XL5 in black. That was the case on both sides. 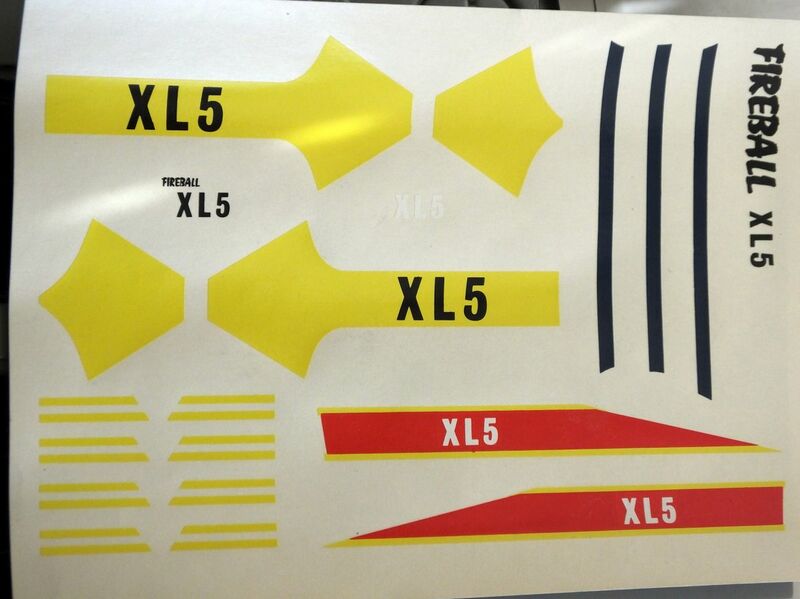 The decal sheet has both FIREBALL and XL5 in black on one side and just XL5 in white for the other. There is an odd FIREBALL XL5 decal at one end of the sheet (upper right in the photo). It does not correspond to anything on the real thing. Maybe it is intended for a display stand. 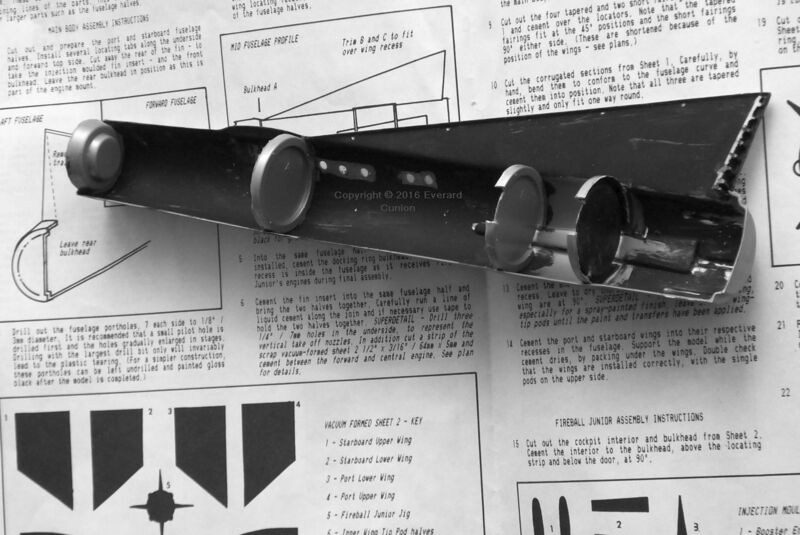 If you want to make the television XL5, the XL5 part of that decal is two millimetres too wide and about half a millimetre too tall for the nose cone. Some closing up of the horizontal space is fairly easy and even shortening the heights of the X and L is not too difficult, which just leaves a slightly too tall number 5, which I figured I would put up with. 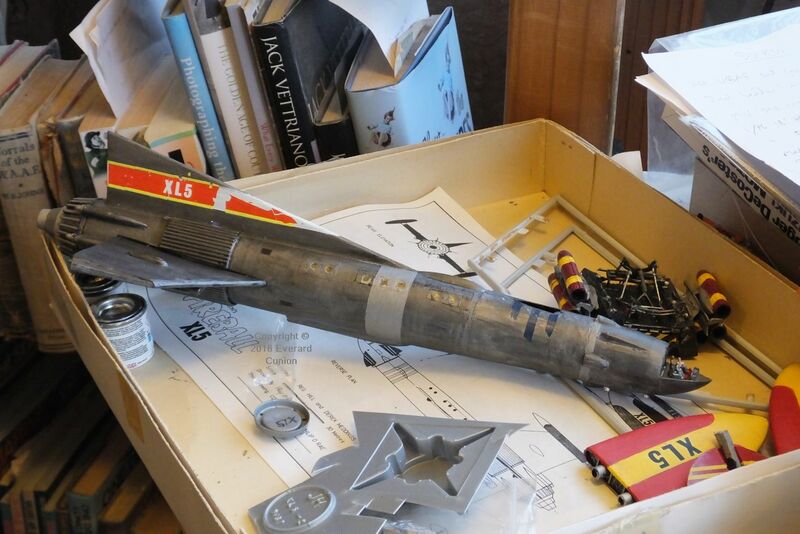 As it turned out, the proper black XL5 nose cone decal disintegrated spontaneously on the backing when soaked. I painted on the XL5 by hand. The other one – the one I cut and trimmed – broke apart some, but it was nonetheless usable and I retouched it by hand. Neither side bears looking at with a magnifying glass. For the white hand-painted FIREBALL lettering on both sides, initially I used a white ‘fine tip paint marker’, which I bought from an artists’ materials store for the purpose. (Yet another semi-reliable and fiddly modellers’ tool…) However, when I coated the model in enamel varnish (satin mixed with gloss) it dissolved the white. No great loss. Eventually, I settled on a blurry marking using a silver Sharpie, a fine felt-tip pen, the silver not being as bright as the white when overdone in that way. Like most real aircraft (and I assume some real multi-mission spacecraft) the fictional Fireball XL5 underwent a ‘repaint’ when it appeared in detail and in colour in the weekly TV Century 21, which took over the printed version of Fireball XL5 from TV Comic. It sports XL5 in white on the port side of the nose cone. A similar photo taken from the other side (not the same photo flipped and edited) shows XL5 in white also on the starboard side of the nose. The image seems to me not a drawing or painting, but a photograph of a model brightly lit. Maybe it was one of the original studio models repaired, re-painted, and given to the publishers of TV Century 21. Therefore, the kit decals seem to me something of a mix. Whatever, I guess it is legitimate to use the decals as supplied if you are so inclined. 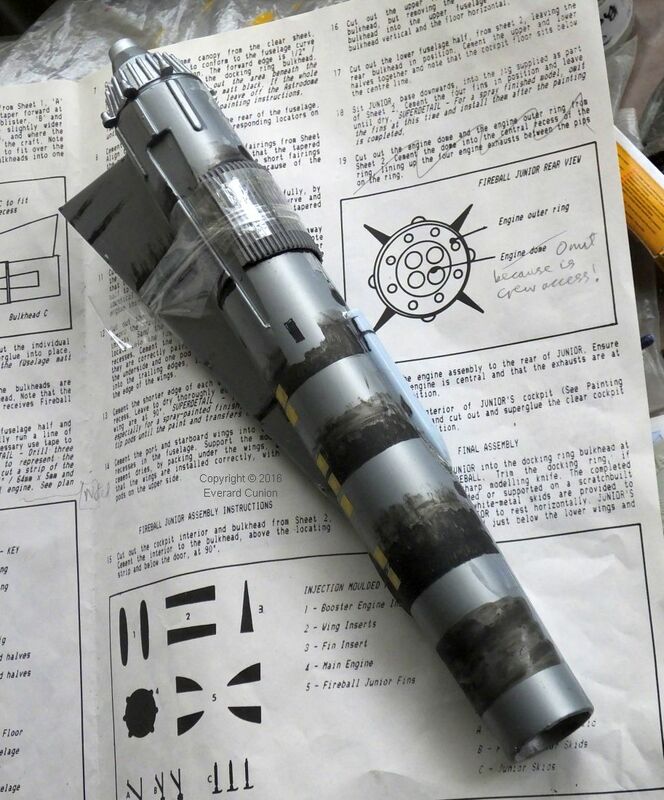 It could represent its appearance on a mission launched part way through a repaint. All in all, I feel that you need to take a somewhat relaxed view of what constitutes the ‘real’ Fireball XL5 colour scheme. Arguably, however you paint it, yours is just as real as anyone else’s! 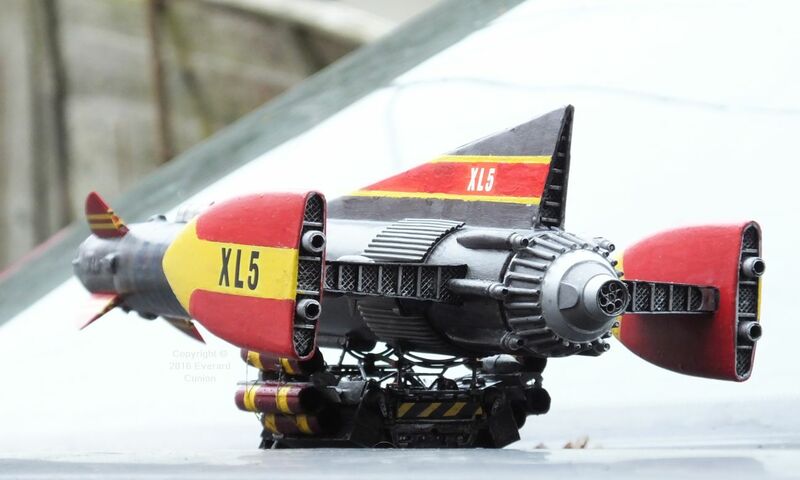 The Comet Miniatures 1/200th scale Fireball XL5 does not come with a launch trolley or rails. (I read that they produced a Fireball XL5 kit in another scale, made partly of glass fibre, which did come with a launch trolley.) I made a trolley using parts left over from other models. The main chunk of plastic is a piece of a broken up Star Trek spacecraft I was given. (I knew it would come in handy one day!) 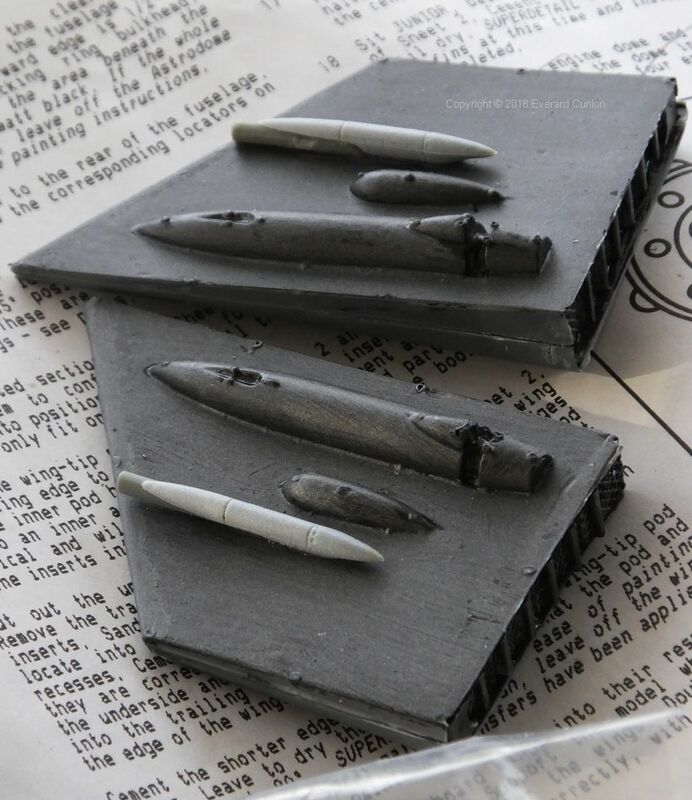 The launch rockets I attached to it are made from pods and pylons left over from two Airfix 1/48th scale Blackburn/BAC Buccaneers. (Rockets or maybe jets? They have holes in the front.) For the support frame I used an engine stand from an Academy 1/48th scale F-86 Sabre and some struts and details left over from an Academy 1/48th scale P-38 Lightning. One aspect that looks naff to me in the original XL5 rig is the use of what seems to be yellow insulation tape to hold the launch trolley rockets/jets together. My nod towards the original in that respect is painting yellow bands round the engines where the tapes were in the original. Incidentally, in the launch sequence that opens each episode of the television series, XL5 rests with the wings directly over the trolley. However, when on the launch roll viewed from in front and above, the trolley is farther forward under the fuselage. Then, in a closer view from slightly behind, it has moved aft again! As of this writing, I have not figured out how to build a launch rail. Although Fireball XL5 pre-dated Sylvia and Gerry Anderson’s Stingray, the several air- and space craft of Thunderbirds, and the variety of ground- and sky based machines in Captain Scarlet and the Mysterons, XL5 seems to me so good looking and so realistic in its operation that it outshines those later machines by an order of magnitude. The equivalent hardware in what I consider to be Gerry Anderson’s finest achievement; the computer animated 2005 New Captain Scarlet, maybe matches Fireball XL5 along that dimension. However, those two productions are separated by the 40 years that spanned both the ‘space race’ and the computer revolution. The Comet Miniatures 1/200th scale Fireball XL5 kit is largely vacuum formed and I found building it to involve a lot of work. I am a ‘rough and ready’ modeller, not suited to such delicate tasks, which maybe accounts for some of the difficulties I encountered. Falcon excel, another XL craft, but a real one this time, although finished in a paint scheme of a later Gerry Anderson series: My Skunk Models Workshop 1/48th scale General Dynamics F-16XL in Spectrum colours. Fireball XL5 : A tribute computer animation by Chris Thompson on YouTube. The backing music, an instrumental by Guy Taylor titled Încântat de Cunoştinţă, seems to me to mourn the passing of belief in our ability to simply fly to other planets in a couple of hours or so. It then livens up to a celebration of this imaginary glorious adventure. 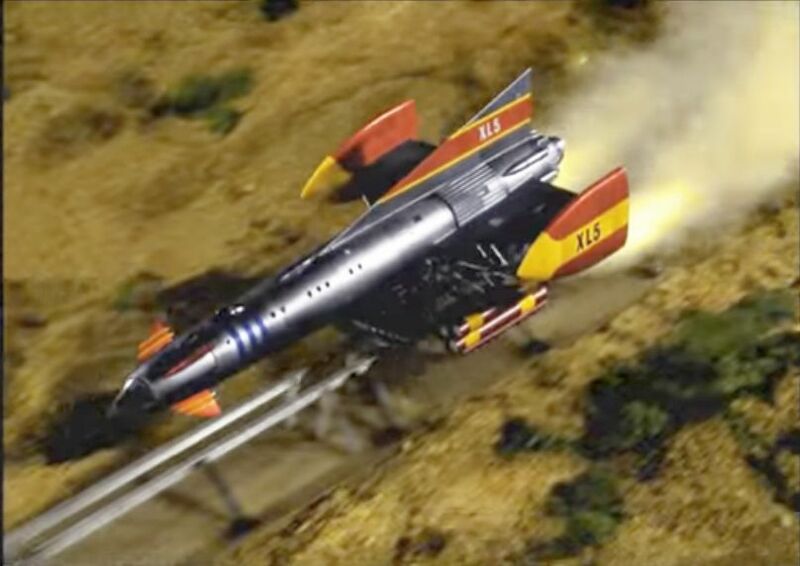 Fireball X-15: SCOTT CROSSFIELD’S X-15 EMERGENCY on YouTube. The explosion of the first X-15 with the ‘big engine’ being run up on the ground in 1960, narrated by Crossfield himself.